Hematologic and oncologic emergencies are among the most common cases of emergency services worldwide.While some patients have a previous diagnosis; others may apply for a hematologic oncologic emergency and then receive their initial diagnosis. In this article, we prepared a series of topics ranging from a series of hematological diseases consisting of anemia, sickle cell disease, G6PD enzyme deficiency, autoimmune hemolytic anemia, von Willebrand's disease and immun trombocytopenia, as well as classical oncologic emergencies such as abnormal uterine bleeding, neutropenic fever, tumor lysis syndrome and vena cava superior syndrome. Here, we present hematologic and oncologic emergency cases. 1. Atalay G , Başaran M. Onkolojik Aciller. Klinik Gelişim 2004; 17 ;16-19. 2. Rodeghiero F, Castaman G, Dini E. Epidemiological investigation of the prevalence of von Willebrand's disease. Blood 1987;69(2):454-9. 3. Lak M, Peyvandi F, Mannucci PM. Clinical manifestations and complications of childbirth and replacement therapy in 385 Iranian patients with type 3 von Willebrand disease. Br J Haematol 2000;111(4):1236-9. 4. Ngo KY, Glotz VT, Koziol JA, Lynch DC, Gitschier J, Ranieri P,et al. Homozygous and heterozygous deletions of the von Willebrand factor gene in patients and carriers of severe von Willebrand disease. Proc Natl Acad Sci U S A 1988;85(8):2753-7. 5. Mc Clure PD. Thrombocytopenic purpura in children diagnosis and management. Pediatrics 1975; 55:68-74. 6. Walker RN, Walker W. Idiopathic thrombocytopenia, inital illness and long term follow up. Arch Dis Child 1984; 59:316-21. 7. Provan D, Stasi R, Newland AC, Blanchette VS, Bolton-Maggs P, Bussel JB, et al. International consensus report on the investigation and management of primary immune thrombocytopenia. Blood 2010;115(2):168-86. 8. Cappellini MD, Fiorelli G. Glucose-6-phosphate dehydrogenase deficiency. Lancet 2008;371(9606):64-74. 9. Berkow R. The merck manuel G6PD Tanı / tedavi el kitabı. çeviri ed: Keklikoğlu M, Tuzcu M. İstanbul: Nobel Tıp Kitabevleri Ltd, 1995: 1136-74. 10. Andrews MM, Mooney KH. Alterations in hematologic function in children. In: Mc Cance KL, Huether SE, eds. Pathophysiology. Missouri: Mosby-Year Book Inc., 1994: 908-42. 11. Fairbanks VF, Klee GG. Biochemical aspects of hematology. In: Burtis CA, Ashwood ER, eds. Tietz textbook of clinical chemistry. USA: WB Saunders Co 1994:1974-9. 12. Ayker E, Çınar M, Göközdoğu G , Aksoy Z , Bambul N. Otoimmün Hemolitik Anemi. Göztepe Tıp Dergisi 2001; 16: 108-110. 13. Powers JM, Buchanan GR. Potential for Improved Screening, Diagnosis, and. Treatment for Iron Deficiency and Iron Deficiency Anemia in Young Children. J Pediatr 2017;188:8-10. 14. Kılınç Y. orak hücre anemisi:tanı, takip, tedavi ve transfüzyon. Talasemi ve hemoglobinopatiler 2010. 255-62. 15. ACOG Committee Opinion No. 651: Menstruation in Girls and Adolescents: Using the Menstrual Cycle as a Vital Sign. Obstet Gynecol 2015, 126(6):e143-6. 16. Munro MG, Critchley HO, Broder MS, Fraser IS; FIGO Working Group on Menstrual Disorders. FIGO classification system (PALM-COEIN) for causes of abnormal uterine bleeding in nongravid women of reproductive age. Int J Gynaecol Obstet 2011;113(1):3-13. 17. Pi J, Kang Y, Smith M, Earl M, Norigian Z, McBride A. A review in the treatment of oncologic emergencies. J Oncol Pharm Pract 2016;22(4):625-38. 18. King JE. What is tumor lysis syndrome? Nursing 2008;38(5):18. 19. Yılmaz M. Vena Kava Superior Sendromu. 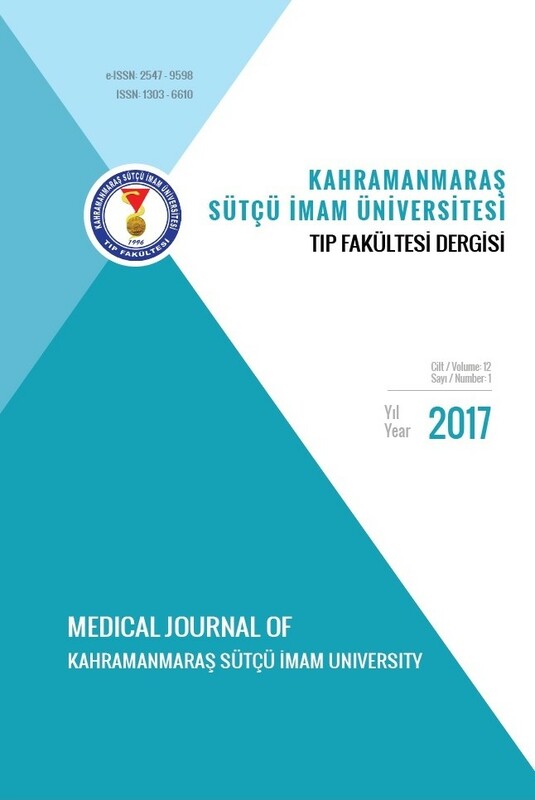 Turkiye Klinikleri J Hematol-Special Topics 2016;9(3):21-5. 20. Castagnola E, Fontana V, Caviglia I, Caruso S, Faraci M, Fioredda F, et al. A prospective study on the epidemiology of febrile episodes during chemotherapy-induced neutropenia in children with cancer or after hemopoietic stem cell transplantation. Clin Infect Dis 2007;45(10):1296-304.21. Freifeld AG, Bow EJ, Sepkowitz KA, Boeckh MJ, Ito JI, Mullen CA,et al; Infectious Diseases Society of America.Clinical practice guideline for the use of antimicrobial agents in neutropenic patients with cancer: 2010 update by the infectious diseases society of america. Clin Infect Dis. 2011; 52(4):e56-93.